There are a lot of things that are difficult to achieve twice in one day. Running a marathon is difficult to achieve twice in one day. Having a civil conversation with your mother without her bringing up your ex or unfinished college degree is difficult to experience twice in one day. And despite it being a busy Saturday afternoon and her age suggesting she calls her grandkids by her long dead pets’ names, getting free samples of Colby jack cheese cubes from the same latex-clad, salty Homeland employee is surprisingly difficult to do twice in one day. But something that apparently is surprisingly easy to achieve twice in one day is getting arrested. 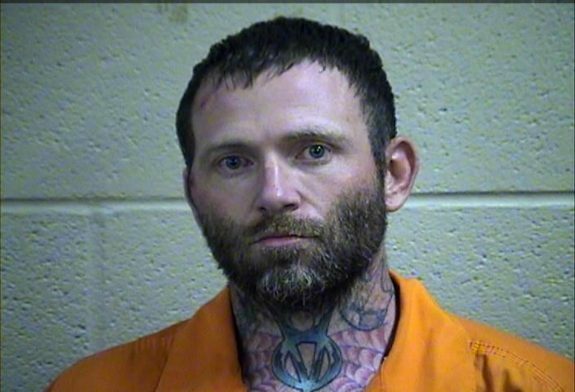 McLOUD, Okla. – A man was arrested for a second time early Wednesday morning after escaping a moving patrol car following a standoff with police. It happened around three a.m. Wednesday near I-40 and McLoud Road. When 34-year-old Roy Roberts wouldn’t come out of the vehicle, it led to a brief standoff until the suspect surrendered to officers. Well that sure seems anticlimactic. I am sure that even though the boys and girls at McLoud PD had a little action with the standoff, they probably thought they had an easy open/shut case and booked Roberts smoothly. But little did the officers know that they were dealing with a real cold-blooded criminal. However, it didn’t end there. After that, Roberts gave authorities from several law enforcement agencies quite the run around. “They were transporting him to the Pott. County Safety Center when the suspect was able to slip the cuffs from behind him in front of him, managed to get the window down in the patrol car and bailed out of the patrol car,” Chief Elliott said. According to police, after escaping the moving vehicle, Roberts ran through a wooded area to a nearby Love’s, went inside and hid in a cooler. Police arrived a short time later and took Roberts into custody again. This time, the patrol car made it to the Pottawatomie County Safety Center with the suspect still inside, following his unusual escape hours earlier. I have a few questions about his scenario. 1. How did Roberts make his great escape through the window of a moving cop car? Was the transporting officer be-bopping down McLoud Main drag with the car windows cracked and blasting Kid Rock’s greatest hits too loudly to notice Roberts’ shenanigans? 2. I’ve never attempted to dodge the cops, but wouldn’t the glass door of the Love’s cooler be a terrible place to hide behind? 3. How did they come to find Roberts chillin in the cooler? There’s a giant plot hole here and I feel like we pay enough law enforcement-funding taxes to deserve the rest of this story. Guess he went from one cooler to another. Such a shock. Usually neck tattoos indicate outstanding character. 3. Was the initial infraction actually “driving a suspicious vehicle” and “carrying a weapon”? I thought both of these inalienable rights were jealously guarded and protected by our glorious state laws. By God and by rights, every one of us Oklahomans has the right to be suspicious ourselves and of one another while carrying lethal weapons without permits. Have they heard of the constitution in McCloud, or have they succeeded the union? Thank you for the much-needed chuckle today “Marc with a C”! I have questions. What about this, “…latex-clad, salty Homeland employee…”? Pictures? Nomination for the next TLO bracket.